Posh waterfront gated community. Hot area with a mix of professional residents along with celebrities. Bay Point Miami is located on the Upper East Side of the City of Miami between NE 41st and NE 50th Street. The community resides to the south of the exceptional Morningside neighborhood and features a variety of different home sizes and architectural styles. The community enjoys extensive security and a beautiful waterfront setting.Bay Point Miami attributes a great deal of its popularity to the prime location. With the emergence of nearby Design District, Edgewater, and Wynwood, Bay Point is surging in demand as a prime destination for active families. The neighborhood has been making quite a bit of news recently as one of the hottest palces to live in all of Florida. The Upper East side has undergone a tremendous resurgence within the past decade, and for single family home buyers, the prestige and safety of a gated community place Bay Point Miami at the top of the list regarding desirability and livability. One interesting fact about the community is that the streets are all privately owned by their residents. This method of ownership serves to protect the streets and water frontage to Bay Point Miami homeowners, which total out to a mere two hundred and fifty. The twenty-four / seven patrolled security further makes this enclave all the more private and residential. It could be seen as a La Gorce Island of Miami for this reason...private, serene and tranquil, yet still very, very close to the action that downtown Miami has seen. And there is plenty of action nearby from a cultural and entertainment perspective. To best describe the exciting progress of the area, one would naturally start with the uber-posh Miami Design District, located adjacent to Bay Point between North 36th and 40th Streets. The ascension of that area alone has catapulted the desirability and value of Bay Point real estate. Only a decade ago, the Design District was still lagging as the victim of urban decay. However, the last ten years have brought forth an incredible turnaround that is nothing short of miraculous. Developer Craig Robbins led the charge of an incredible metamorphosis into one of the most expensive and posh retail areas in the United States. Public and private investment into the area surged through the years, and the small local shops were bought out by iconic global fashion and luxury brands. The eighteen block area started the turnaround with designer Christian Louboutin opening his retail store and then was soon followed by Yohji Yamamoto. Next, a steady stream of top luxury retailers made bold moves by announcing that they would be closing their Bal Harbour stores and relocating to the Design District. The chic French Designer Hermes, famous for their outrageously expensive handbags, belts, and other luxury goods announced the opening of a thirteen thousand square foot flagship store (with their other two flagships residing on Rodeo Drive in Beverly Hills California and Madison Avenue in New York City). The area has exploded in popularity and is now the shopping hub for the rich and famous jet setters of the world. There are now over 100 luxury retailers open in the Design District. It's no doubt that Bay Point homes will continue to receive the benefits of appreciation due to the incredible value of the neighboring retail community. Bay Point Miami is consequently turning into another Beverly Hills. Furthermore, if it wasn't enough to see the meteoric rise of the property values of the Design District, the area of Wynwood just to the South of the Miami Design District has experienced a rocket-like take off of its own. For what the Design District is to luxury retailers, Wynwood is the same for food, culture, and entertainment. It is an art-lovers paradise and is a focal point for the prestigious Art Basel event every December which is the greatest meeting concentration of wealth in the world every year. The rise in Wynwood offers tremendous benefits to Bay Point Miami real estate by offering its residents some wonderful dining and entertainment options that are only a few minutes away. Some of the ultra-popular restaurants in the area include the Wynwood Kitchen and Bar, Jimmy's Kitchen Wynwood and the delicious SuViche Wynwood. Spend a night out enjoying the countless special events near the Wynwood Wall art exhibitions and then stroll into the Michael's, the highly-acclaimed gourmet eatery in the Design District. Bay Point sits in the perfect location next to these vibrant communities. The homes in Bay Point are quite impressive, both in their picturesque settings and by their architecture. Magnificent waterfront estate homes are present throughout the community with the most prestigious street being Sabal Palm Road, which has been widely recognized as on the most expensive residential addresses in all of Florida. Most of the few original homes still standing within the community were built in the 40's through the 60's, with a variety of styles from Mid-Century Modern to old world Floridian. However, the vast majority of those homes have changed hands during the recent boom and have been replaced with stunning more modernized designs. These designs make use of more wide open floor plans, walls of glass and large patios offering a perfect indoor-outdoor lifestyle to perfectly compliment the endless summer of South Florida. The affluent residents that make up the neighborhood are a mix of successful business figures and celebrities. Some celebrities that live in Bay Point have included the iconic singer Enrique Iglesias, rapper DMX, and star baseball pitcher Livian Hernandez. Iglesias purchased a $26 mil 20,000 square foot waterfront mansion within the community in 2013. 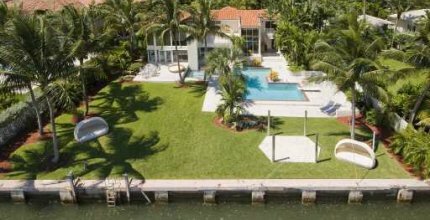 His Bay Point Miami home resides on a double lot with a tennis court (no doubt for playing with his longtime girlfriend) the beautiful tennis pro, Anna Kournikova. It is the second home for Iglesias in the area after recently selling his old home to move into the much larger dream home. They are widely known as kind and courteous neighbors by many within the community. 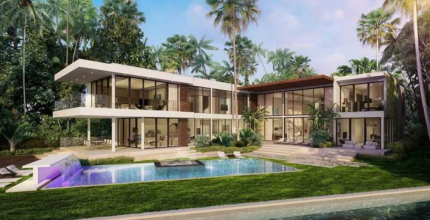 Another international celebrity has moved into the neighborhood as well, Miami Heat star point guard, Goran Dragic recently bought a six thousand five hundred sq ft waterfront home for $7,900,000. The magnificent waterfront estate is located on the famous Sabal Palm Road and boasts 7 bds, 6 baths and a gorgeous pool with amazing views of the Bay of Biscayne. Dragic signed a $85,000,000 five-year contract back in the summer of 2015 to play with the Heat, and he fell in love with the location and convenience of a Bay Point house. He quickly marked the community as his top choice and made the move to acquire his property at a good value. The superstar point guard's timing was outstanding because it is rare to find bayfront homes for sale in Bay Point. Anyone looking to find homes for rent in Bay Point Miami may have a few options given the time of year. The exceptional schools nearby make this community a perfect one for families. The highly-acclaimed Cushman School is a private elementary school for grades Nursery through Eighth. The Design Architecture Senior High School (DASH) is extremely close by and is consistently ranked as one of the top high schools in the State. While the Miami Country Day School is a nearby private school that is well recognized for its ultra-small class size and nonreligious affiliations. The school resides on sixteen acres and has state-of-the-art sports facilities, programs and other top amenities for its students. Bay Point Miami is truly a special community. For countless reasons, it is the rising star of all South Florida real estate. Browse our listings above and when you find the properties that interest you the most, please contact us. We will arrange a private tour and assist you with the process of finding you dream home. Upper Eastside gated community. Excellent value. Historic and private. Belle Meade Miami is a highly sought-after neighborhood that has a distinctive and tranquil residential feel. The southern portion of the community is known as the Bayside District, which is known for offering tremendous value, still defying the odds amongst Miami real estate's ascension into extremely expensive territory. It is here that families may still purchase starter homes at reasonable prices that will prove to be phenomenal investments for the future. The northern part of the community contains Belle Meade Island real estate, which is widely recognized as being one of the absolutely most desirable locations in all of South Florida for a single family home. Many of the houses on the private island are simply jaw-dropping, a sight to see if you enjoy stunning architecture and gorgeous waterfront houses that can be best described as true mansion estate homes. Some of Miami's most unique and private waterfront and non-waterfront homes exist within Belle Meade Miami. Many of the waterfront properties offer incredible, convenient access to the Bay of Biscayne through homes with abundant water frontage. 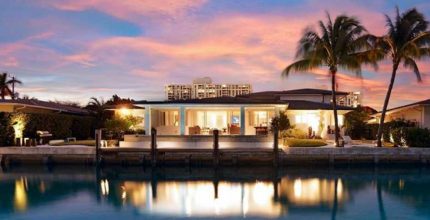 The large boat docks on these residences are certainly valuable and offer great upside for future price appreciation due to the limited number of waterfront homes in Miami that offer the large docks. The artistic culture permeates deeply within the community, and the rapid revitalization of Biscayne Blvd. has had a resoundingly positive impact on home prices. The emergence of the uber-hop Miami Design District has galvanized the location of Belle Meade Miami as being one of the very best spots to purchase a starter home and hold for the long run. Over the course of the last decade, the Design District has become the new Rodeo Drive are of Florida. It is only a short five-minute drive away from the community and now contains some of the best shopping in the world with some of the world's top fashion and luxury brands opening up decadent flagship stores that are magnets for the world's elite to do their shopping. The amazing Bvlgari building with its iconic lighting and contemporary design meshes with the incredible design of Tom Ford's boutique and others like Valentino, Rolex, and Prada. In fact, Bal Harbour has lost a great number of its tenants to the Design District, allowing many to feel that the DD and its surrounding residential communities are the new Beverly Hills of Miami. The area also has incredible restaurants that make date night quite fun and convenient. Residents can look no further than Michael's Genuine Food and Drink or MC Kitchen for an incredible dining experience. The emergence of the Biscayne Corridor has brought with it a number of other dining and entertainment options just down the street from Belle Meade homes. Residents have easy access to the new exciting happenings of the art scene in Wynwood, which just to the South of the Design District has undergone a resurgence of its own. Wynwood has achieved explosive growth and status over the past decade and is now the headquarters of the chicest and exclusive art festival in the world. Every December the wealthiest art lovers in the world flock to the area to form that greatest concentration of affluence in the world during that period. Wynwood also offers a number of fun bars that are a short uber ride away. A bit further down Biscayne Blvd, one can find abundant culture at the Adrienne Arsht Center for the Performing Arts, the cultural capital of Miami along with the new Jorge Perez Art Museum. Also in the area is American Airlines Arena where the world-famous Miami Heat play. With the 79th Street Causeway sitting adjacent to the community, getting over to the incredible beaches of Miami Beach is a breeze. The area around the community has undergone an elaborate streetscape improvement that had been funded by the Miami DDA. All in all, the location of Belle Meade Miami is simply outstanding, it can't be beat in terms of convenience and lifestyle options. 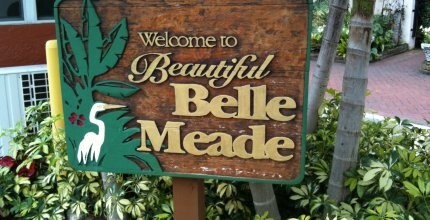 The Belle Meade Miami homes for sale offer a number of highly attractive options when they do hit the market due to the great value of being just to the north of the Design District. Waterfront communities to the South by only a five-minute drive can be double the price for a non-waterfront home. There are often large homes available for under $750,000, which is an outstanding value. Other waterfront homes range north of $6,000,000 for gorgeous estates that are fit for royalty. You'll see a blend of architectural styles ranging from classic Floridian to Mediterranean and of course contemporary. Many of the older Belle Meade houses tend to get purchased quickly as tear downs and are made into ultra modern palaces that utilize walls of glass, large patio doors, and incredible landscaping to create an unprecedented indoor / outdoor lifestyle. Browse our listings and be sure to contact us. We may have some additional properties available that are currently not listed publicly by their owners, but could be sold for the right price. So be sure to reach out to see your full range of options. Take a step forward into the perfect future and find your dream home today! Consistently rated as one of South Florida's top residential neighborhoods. Popular and charming small town feel. Residents love the easy access to the neighborhood golf course and country club. The Miami Shores homes for sale are an assortment of properties in various sizes and styles that can suit nearly every preference imaginable. This historic district still offers exceptional values for new home acquisitions. There are over four thousand homes within the community, but you would never guess that from exploring the surroundings. The village-like feel is prevalent. Strolling around the streets, it's sometimes hard to imagine that downtown Miami, with all of its cultural and entertainment options, is so close by. The community is actually just minutes away from the downtown Miami area and Miami Beach. The area has greatly benefitted from the modernization and development of the Biscayne Corridor. The upgrades and beautification of Biscayne Boulevard have made the homes for sale in Miami Shores all the more desirable. The area is the perfect place to raise a family due to the many supporting amenities within the neighborhood. Starting with the Miami Shores Montessori School, the educational opportunities for children in the area are outstanding. In this Academy, children are allowed to learn at their own pace and work both individually and in groups to optimally foster their personal development. Many afterschool programs are available including an art club, gymnastics lessons, ballet, a reading club and a special brain power enrichment group. The Achievers Academy High School is also based in Miami Shores and allows for an excellent education throughout adolescence. Students can even move forward and attend university without ever leaving the community. Barry University is a Catholic college that is based in the neighborhood. There are many options for those that enjoy cultural activities and the performing arts. The Miami Theater Center is a popular theater that has past nostalgia dating back over seventy years ago to the dawn of another era for the community. The theater has been tastefully remodeled to give it the perfect blend of the past and convenience of the future. The Miami Shores Country Club offers an eighteen hole championship course that is quite popular and challenging for locals and visitors alike. It's also a premier spot for weddings and other special events like engagement parties and banquets. There are several top level tennis pros to give out instruction and clinics for juniors, men's, and women's play. Social memberships for the club start as low as two hundred and seventy-five dollars for the annual dues. This facility has made Miami Shores real estate quite popular. The homes for sale in Miami Shores have a distinctive overall character. They have kept a good deal of their famous Art Deco designs that have made Miami famous. The best part about the neighborhood is that prices are still incredibly reasonable. They are some of the best values in Miami, if not the very best. Starter houses can be acquired for under three hundred thousand dollars while some of the larger mansions sell for several million dollars. Many real estate experts see the community as quite stable and ready to steadily appreciate. Building and development restrictions should keep the special residential feel within the community for generations to come. Miami Shores rentals are in high demand due to the distinctive residential ambiance. A large home can sometimes be rented for under three thousand dollars with proper timing (winter months are the time of peak demand). All in all, the community is the perfect place to acquire a home for the long run. Browse our listings above and be sure to contact us today. We will arrange the perfect private property tour for you. Also, we may have access to some off-market properties that are not currently advertised by their owners, but could be acquired for the right price. We will leave no stone unturned in find you the optimal new home. Live in your dream community. Start the journey today! Rich history. Popular with younger families. Classic architecture and affordable homes. Morningside Miami is located on the Upper Eastside and is known for having pleasant views in every direction that are unimpeded by any large buildings. Residents love their outdoor activities and the overall walkability of their neighborhood. During the 60’s this community was hip and sought-after as one of the best places to live in South Florida. Today, the new wave of commercial development up the East Side of Miami has brought Morningside back into a renaissance of the past. It’s an exciting community that is certainly up-and-coming. The excitement surrounding the new renaissance of the neighborhood begins around the exceptional location and unique history that gives the community a deep sense of culture that isn't present in most American cities. While America may seem to have more conveniences and technologies, as a newer country, it seems to lack the depth of Europe or Asia. However, history and culture are relative to neighborhoods, and Morningside is one of the oldest parts of Miami with deep roots. Its position to the east of the Biscayne Blvd makes it a prime waterfront community that is ripe for appreciation through the upcoming years. An interesting point of history is the fact that of all places in South Florida to stay. Pope John Paul the Second stayed in the Morningside neighborhood on his trip to the United States. The community was founded in the year nineteen twenty and back then was named Bayshore. For the next few decades, the neighborhood prospered. Between the years of nineteen twenty-two and nineteen forty-one, development within the community underwent a great deal of expansion. The area was a virtual museum of design and architectural masterpieces with countless homes expressing the masterful evolution. The famed Art Deco styles combined with Spanish and Tutor Revival styles to make for wonderful diversity. Beautiful boulevards were created with gorgeous trees providing a canopy of abundant shade for those enjoying strolls around the neighborhood. The area attracted wealthy snowbirds from the northeast making Morningside Miami homes their perfect winter retreats, while the year-round residents took advantage of the endless summer weather. The dawn of the nineteen sixties saw the community regress into urban decay and it stayed there for nearly twenty-five years over past the Miami Vice years and drug wars in the streets of Miami. In the early nineties, progress began to take shape. The neighborhood was recognized for its historical significance and was designated a Historic District. It was the first such district named in the city Miami with borders extending from North East 55th St to North East 60th St. From there, more progress was made. The turn of the century brought an entirely new metamorphosis for Morningside real estate. The value of waterfront land close to the revived Cultural District, downtown Miami and the Design District all proved to ascend the value of any Morningside homes for sale. A massive gentrification took place and the community enjoys a consistent rise in property values. The Morningside neighborhood is now well-recognized as an excellent home for families. The walkability of the community leads to an amazing residential feel that is difficult to find in other parts of the city. Living so close to the water gives a feeling of tranquility and peace that is priceless. The striking beauty of homes within the community is so unique that there are home and neighborhood viewing tours that have been created by local tour operators. In addition to the gorgeous tree lined streets, Morningside Park is a wonderful oasis from the hustle and bustle of daily life. It's the perfect place to lay down a blanket and pack a basket full of treats, sipping wine and enjoy the perfect Florida weather. The serenity is intoxicating and uplifting. Security for the neighborhood is in a class by itself. The installation of guard gates in the year 2000 added an extra dimension of safety for those living in Morningside Miami homes. It has kept out any petty crime from the area which has significantly dried up over the last decade as the entire Upper East Side has grown in its prestige. Residents love the easy access to the Design District which has recently exploded in its popularity and status. The area now has some of the best shopping and dining options in all of America. With iconic fashion houses like Fendi, Marc Jacobs, and Dior, it is overtaking Bal Harbour is the best shopping in South Florida and it is only twenty blocks away for the community. Dining options are also amazing with the highly-acclaimed Michael's Food and Drink only minutes away. Morningside Miami homes for sale offer something for just about every budget and taste. And they are still seen as offering great value for a waterfront, guarded, single family home community. Homes can often be found with an entry price of just over one-half of a million dollar, while larger waterfront estates can price out at several million. Morningside Miami house rentals are also quite popular; they aren't on the market often. Browse the homes listed above and be sure to contact us once you have done so. We may also have some opportunities for you with homes that are not marketed to the general public by their owners. We will arrange a private showing tour of the very best properties in the community and even extend out into similar neighborhoods if you so choose. Live in your dream home. Take the leap forward today. High status in one of the world's greatest cities. Primed for generations of future appreciation due to the city's wonderful international appeal. Miami homes are encircled with countless entertainment options, attractive neighborhoods, exciting shopping malls, electrifying nightlife and a conglomeration of restaurants that offer a multitude of cuisines for a fantastic dining experience. In addition, other than being one of the top tourist destinations in the world, it is emerging as a preferable place to live and work. The city is lush and green year round. Even though it has steamy summers, the breeze from the ocean pushes temperatures down, making Miami a preferable place for cycling, windsurfing, golf, tennis and boating. Located on a broad plain between Biscayne Bay to the east and Florida Everglades to the west, it contains several natural islands, the biggest of which contains the South Beach and Miami Beach. For thousands of years, Miami was inhabited by indigenous cultures before encountering the Europeans. It became popular as a seaport city on the Atlantic Ocean located in South Florida. Due to this, it has attracted quite a number of people, making its metro area the eighth most populous urban area in the U.S., according to the U.S. Census Bureau. Ranked as the 8th best city to take a walk, Miami is the ideal location to live if you don’t have a car. Its overall walk score is 86; therefore, you can do most things on foot – from experiencing the culture, to enjoying the beaches and having fabulous shopping and dining experiences. At first, Miami might seem confusing, but becomes easy to navigate with time. The geographical heart of the city is located in the downtown area, composed of a cluster of buildings close to the beaches and airport. Miami mainland houses cover a dozen neighborhoods that make it among the list of the best destinations to live with your family or visit as a tourist. The Upper Eastside of Miami homes stretches between Wynwood’s street areas to North Miami’s suburban tranquility. It is an eclectic community with a blend of urban sophistication in a rural setting, making it a fantastic location for children to grow up. It has attracted the likes of artistic and creative professionals, primarily becoming a residential neighborhood filled with historic homes which have been beautifully preserved, making it have a throwback feeling where life traveled at a slow pace and people were not overly occupied with ever-growing technology. It also has modern condominiums to show modern architecture, placing a high value on natural beauty. It is one of the neighborhoods in Miami, sitting on Biscayne Bay. Morningside has a deep history and sense of culture. It is considered one of Miami’s few historic communities that remain intact. Also, it is popular for its beautifully preserved buildings with Mediterranean architecture styles and Art Deco. The neighborhood has its own park, which makes it an ideal location for families who wish to live in a historic area in Miami. Bay Point Estates is an exclusively gated community having streets privately owned by households. People who do not own homes are not allowed access to the community or to use its waterways and roads. The only exception is if they are guests of any of the homes on Sabal Palm Road, which is the most expensive street to live. The best part is that security is tight there, having security service operating 24/7, making it one of the safest Miami single family home communities. The Upper Eastside’s MiMo district is one of the highlights of living in Upper Eastside of Miami. It consists of structures that were originally built after World War II and had been renovated fully. This subdivision is an architectural style of movement that came to be in South of Florida. The name MiMo means Miami Modern, with most of the buildings now serving as hotels, cafes, and other retail shops. The Upper Eastside community is the most diverse neighborhoods in Miami. Different races and ethnic groups reside in the neighborhood, consisting of middle and high income earning families. A lot of the residents include journalists, artists, photographers, writers, and professionals. It is 76% safer to live in than other cities in Florida according to the latest public safety reports. If you have kids, Upper Eastside of Miami is a safe place to live and raise your children with little worries. What attract people to live in the Upper Eastside of Miami is the suburban appeal, and a long list of amenities the neighborhood offers, making it have an urban and modern feel. This community is perfect for families or individuals who are creative and wish to get inspiration. The Upper Eastside of Miami homes has a unique sensibility and charm placing it top the list of the most sought-after neighborhoods in South Florida. Browse our listings above and contact us today to find your perfect Miami home. In speaking with us, we may have some additional properties for you to choose from which might not be listed publicly. We will arrange a private tour of all of the top properties in the community that perfectly fit your appetite and budget. Contact us today. Secure your dream Miami house.